The birth of a baby calls for a lot of extra stuff in the house, which includes baby care essentials, changing goods, clothes, and toys. Handling and taking care of a baby is a demanding task itself, and it seems even more difficult to find time to manage and organize the utilities of the baby, especially at the time of changing. Moreover, keeping each commodity at a different place and putting it back every time after use can become an exasperating job. Delta Children Convertible Changing Unit is the product designed to cater to this need of the parents with an open-shelf, sliding storage space and a convertible changing station while taking minimal space in the room. It comes in easily adjustable parts, which require assembly. 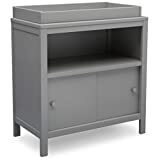 Our changing table buying guide features many more alternatives for you to choose from, or you can just compare this to the fancier crib-changing table combination that is the Delta Children Bentley S.
The Delta Convertible Changing Unit is the right choice if you are looking for something to organize the essentials of your baby. The storage space includes an open shelf and a closed storage cabinet with sliding doors. It has a wooden body which is tested for toxic chemicals including lead to fit the safety criteria set by the American Society of Testing Materials (ASTM). The top of the storage shelf and cabinet serves as a changing unit to clean up your baby and change. This unit could be removed at the time your baby outgrows its need. By removing the top, the storage space increases, making it a simple storage table. The product comes in a sturdy wood material, providing a smooth space for changing and cleaning the baby and storing their commodities. Yet, the changing mat and dressing pads must be bought separately, as they are not included with this purchase. Also, some people find the assembly process an exhausting task. Customers found it to be a convenient and perfect solution to their needs. This product is highly recommended by parents for its multiple uses, handy usability, and minimalistic space requirements. A few customers found it tricky to put it together, yet they were instantly aided with the handbook guide that comes with the package. Hence, this changing table is serving its purpose of providing convenience.